In less than three weeks, 7 million people in the capital will have the chance to exercise their voting rights in the runoff of one of the fiercest gubernatorial elections in the city’s history. While recent elections in the capital have been largely free of conflicts, this time a large mass movement called Tamasya AlMaidah (Al-Maidah Tour) has cast lingering fear among voters, especially with hard-line group Islam Defenders Front (FPI) expected to join the movement. Named after a verse in the Quran that is often used by conservative Muslim political groups to urge Muslims to vote for political candidates of the same faith as themselves, the movement aims to deploy at least 100 volunteers to supervise 1,000 polling stations that they consider prone to foul play on election day on April 19. Al-Maidah Tour initiator Farid Poniman claimed that more than 100,000 people had joined the movement and others would follow suit. When The Jakarta Post checked the apps on Sunday evening, more than 5,000 people had downloaded Al-Maidah Tour from Google Play Store. Farid said such a large number of supervisors was needed because he was certain that the potential for fraud on election day was great. Furthermore, the movement aimed to attract at least 1 million people who could monitor all 13,032 polling stations in the capital. “Besides trained volunteers, we will also deploy our top members at each polling station,” Farid said. Al-Maidah Tour also asked its volunteers to wear white attire for men and full black attire for women and recite Quranic verses and Takbir (praise to Allah) at their assigned polling stations. Due to the name and nature of the movement, people are afraid that the Al-Maidah Tour could intimidate Muslims into not voting for incumbent Jakarta Governor Basuki “Ahok” Tjahaja Purnama, who is a Christian of Chinese ethnicity, and vote for Anies Baswedan, who is supported by a number of conservative and radical Muslim groups, instead. Farid said that while the movement had not set out to support Ahok’s rival Anies Baswedan in the election, his team often communicated with Anies about the movement so they would not overlap with each other in the field. 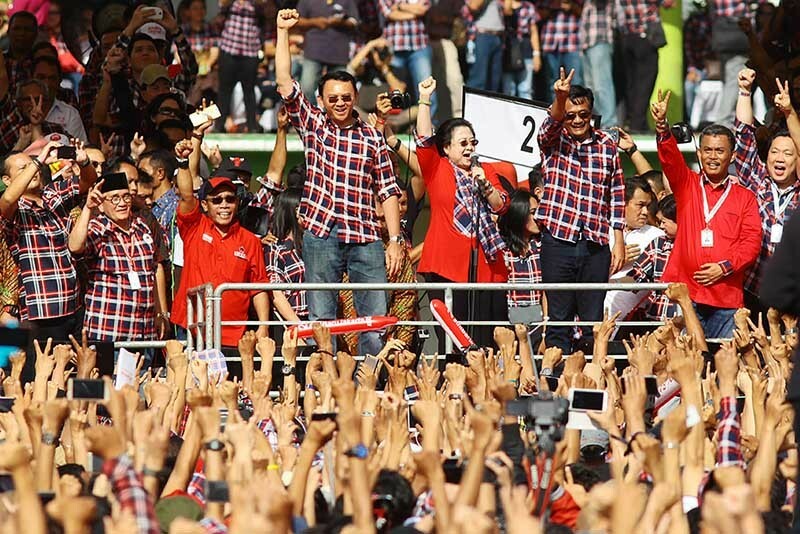 However, Anies’ team has claimed to be unaware of the AlMaidah Tour movement. At the same time, Ahok is grooming his own election witnesses to be stationed at polling stations, fueling concern over potential clashes between the Ahok camp and the movement. However, many doubt that the Al-Maidah Tour will not raise a ruckus as the movement has strong ties to the FPI. FPI spokesperson Slamet Maarif confirmed that his organization would take part in the AlMaidah Tour movement by deploying around 16,000 people on voting day. However, Slamet said the FPI had no intention of intimidating voters, adding that its members’ presence at the polling stations was simply to ensure the election went ahead without a hitch. “On the contrary, we want to make sure that no intimidation happens during the election,” he said on Saturday. Farid, meanwhile, said a large number of people from outside of Jakarta participating in the movement would be accommodated by local FPI members. Farid himself is an official of an FPI-associated group, the National Movement to Safeguard the Indonesian Ulema Council’s Fatwa (GNPF-MUI). Devie Nova, a resident of Tanjung Priok in North Jakarta, said the presence of many strangers claiming to be a monitoring team at her polling station would cause nothing but anxiety and worry among her and her neighbors. She believed that official supervisory teams deployed by the Elections Supervisory Agency (Bawaslu) and the two candidates would be enough to monitor voting booths. “One hundred people [in each polling station] are just way too many. That many people would only make us feel anxious when we are casting our votes,” she said.